London-based designer Yesenia Thibault-Picazo has created three household objects for the anthropocene era, using materials she believes will be used by craftsmen hundreds of years in the future. Called Craft in the Anthropocene, the project is centred around the proposed new geological era, in which human impact is the dominant force on the earth's natural materials. Described as "time capsules for an imagined future", the collection features a pestle, a mortar and a vessel made from raw materials that Thibault-Picazo believes will one day be mined as valuable resources. "Through our collective actions, we have become over time, a global geophysical force intertwined with the most powerful forces of nature, rare in the pre-human era, which will become prevalent sediments, building up the future planetary strata," said the designer. Each material responds to a different environmental challenge, such as animal farming and plastic waste. "The objects offer an extreme projection in a far future of what would become the terrestrial minerals if our civilisation doesn't change its conception of resources consumption," she continued. The materials used in the project include bone marble, made of the sheep and cattle bones that came from victims of the foot and mouth disease in 2001. There is also ocean plastic from the floating debris in the Pacific Ocean and aluminium waste sourced from the River Thames in London. The pestle is made of Cumbrian bone marble – a material that Thibault-Picazo believes will be mined in a few thousand years in Great Orton, Cumbria. "Cumbria was the worst affected region of UK. A total of seven million sheep and cattle are estimated to have been executed to prevent the propagation of the virus," explained the designer. "The scenario speculates that the geological processes exerted to this pile of bones would produce the Cumbrian bone marble. The novel and valuable – because rare – resource would be mined in a few hundred thousand years from now exclusively in Great Orton." The mortar is made from Pacific plastic crust, a material that the designer speculates will form at the bottom of the sea, as a result of ocean plastic merging with the earth's crust. "The scenario forecasts what is to become of the Pacific Garbage Patch if nothing is changed in the coming years. Floating debris in the Pacific Ocean will eventually settle on the ocean-ground, 10,000 metres under sea level, layering into a novel synthetic earth crust named Pacific plastic crust," she explained. The final object is an aluminium vessel that has an irregular shape and a silver, textured surface. The material for this comes from waste dumped into the River Thames. "Aluminium waste, when swept by currents, creates new deposits downstream," she said. "The current practice of metal prospecting will be continued by future prospectors who will seek aluminium nuggets in river deltas." Craft in the Anthropocene is an ongoing research-based project that began in 2013, during which Thibault-Picazo worked with earth scientist Jan Zalasiewicz to create objects based on research by scientists on future geology resulting from the anthropocene era. "The aim was rather to neutrally communicate the scientific theory, projecting information and facts into their future logical extremes," she explained. 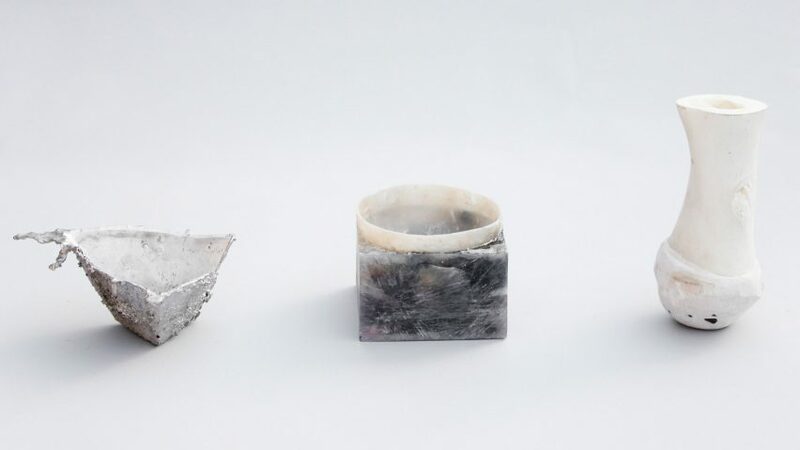 To create the materials, Thibault-Picazo studied a process called geomimicry, which involves engineering materials and reproducing geological processes on a small scale. Very high levels of heat were applied to the chosen materials using a heat press, intended to mimic and accelerate the natural process exerted on these resources over time. Thibault-Picazo said the project isn't intended to solve the problems of the environmental crisis, "but to provoke a reflexion around our conception of nature and ultimately to invite to reimagine how we inhabit the world". "Through the mean of materiality, these future fossils allow an audience to contextualise the premises of the anthropocene theory and project the impact of current activities in the long term," she said. An increasing number of designers are investigating the effects of the anthropocene era through installations, exhibitions and products. These include Xandra van der Eijk, whose installation aims to demonstrate how chemical waste dumping is affecting the earth, and Bram Vanderbeke, who sculpted a series of abstract furniture pieces from blocks made of concrete waste.